This entry was posted in Academic achievements and tagged College of Sciences and Mathematics on April 9, 2014 by Wire Eagle. AUBURN UNIVERSITY – Auburn University and the Southeastern Conference announced today that Professor Geoffrey Hill of the College of Sciences and Mathematics has been honored with the SEC’s Auburn University Faculty Achievement Award for 2013-2014. Hill, an Alumni Professor in the Department of Biological Sciences and curator of birds for the Auburn University Museum of Natural History, will receive a $5,000 honorarium and represent Auburn as the university’s nominee for the SEC Professor of the Year. The SEC Professor of the Year will be selected from 14 nominees representing each of the SEC universities. Each recipient must be a full professor at an SEC university, have a performance history of extraordinary teaching and a record of scholarship that is recognized nationally or internationally. The SEC Professor of the Year receives an additional $15,000 honorarium. Hill’s research focuses on the function and evolution of ornamental traits in birds and on the co-evolution of hosts and pathogens. His research has garnered $8.8 million in external grant support, including grants from the National Science Foundation and the National Institutes of Health. He was recently appointed director of the Division of Integrative Organismal Systems at the National Science Foundation, which is the largest of the four divisions within the Biological Sciences Directorate at NSF. The Division of Integrative Organismal Systems has an annual budget in excess of $200 million and is the primary funding source in the U.S. for basic research in neurobiology, development, physiology, behavior and plant genomics. The appointment comes on the heels of Hill serving as deputy division director of Integrative Organismal Systems during the 2013-14 academic year. Hill has received numerous awards, including the Presidential Early Career Award in Science and Engineering from President Bill Clinton, the Auburn University Creative Research Award, the Auburn University Graduate School Faculty Mentor Award and the Dean’s Research Award, given by Auburn’s College of Sciences and Mathematics. For his achievements in research and teaching, he also was named an Auburn University Alumni Professor. He has published five books with major publishers, including “Ivorybill Hunters: The Search for Proof in a Flooded Wilderness,” published by Oxford University Press, which is the story of how Hill and two of his colleagues stumbled upon what may be a breeding population of Ivory-billed Woodpeckers, a bird long thought to be extinct, in the swamps of northern Florida. His most recent book, “National Geographic Bird Coloration,” is a work on bird coloration and plumage for the general reader. In addition to his books, Hill has been cited in more than 10,000 scientific papers and has published 218 papers in scientific journals such as Science, Nature, Evolution, BioScience, The American Naturalist, Trends in Ecology and Evolution, and Proceedings of the Royal Society of London. He has also served as editor for the journals Frontiers in Ecology and Evolution, and Animal Behavior. Hill is a Fellow in the American Ornithologists’ Union and a member of several professional organizations, including the American Association for the Advancement of Science, the Evolution Society, and the International Society for Behavioral Ecology. 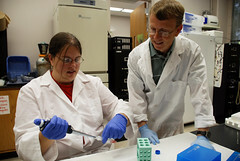 He was invited by the executive director of the National Academy of Sciences to be one of 50 U.S. scientists to participate in the 10th Annual Frontiers of Science Symposium, and, in 2010, he was invited by NSF to serve on the planning committee for the National Ecological Observatory Network initiative. As the curator of birds for the Auburn University Museum of Natural History, Hill has established one of the largest loose-feather collections in the world. He also has increased the ornithological research collection to include more than 2,000 bird skins, 50 bird nests with eggs, and 50 empty bird nests, as well as a large teaching collection of more than 100 bird skins, 50 bird nests and about 30 full taxidermic mounts of birds. Hill holds a Bachelor of Science from Indiana University, a master’s from the University of New Mexico and a doctorate from the University of Michigan. He has been an Auburn University faculty member since 1993.